The Armed Forces, by the very mandate from the political leadership, are trained to preserve a nation's ideology, constitution and ensure peace for the citizens. As a natural corollary, there is need for an Armed Forces that is of adequate strength in number and provisioning, with capacity to perform its mandated tasks with minimal loss to the state, while preserving its skilled and trained manpower. This automatically means that a soldier is willing to inflict damage to the enemy and, at the same time, willing to sustain injury or even lay down his life in accomplishment of given tasks. Thus, Armed Forces Medical Services has a huge duty to maintain the health of the troops, and at the same time, be a huge motivating factor to a soldier who has faith in the medical services, and goes into the combat situation with an unbinding faith that the medical services will be there when he/she may need them. In addition, what maintains a high degree of motivation is the fact that the medical services will take care of the soldier as well as his/her family in case of any illness to whatever extent required. The realm of neurosurgery in the Armed Forces has thus a broad canvas, ranging from the battlefield scenario, head and spine injuries, to management of complex neurosurgical problems that may afflict the soldier, spouse, children and parents. There is no record of neurosurgery as a specialty in the Armed Forces prior to May 1942, when Britain was deeply embroiled in the second World War. Two mobile neurosurgical units (MNSU) arrived in May 1942 from Britain to provide neurosurgical treatment to troops in the Indian subcontinent and South-East Asia. Each MNSU had four medical officers (one neurosurgeon, one neurologist, one anaesthesiologist and one general duty medical officer). In addition, the unit had two nursing sisters, six operation room assistants (ORAs), and was equipped with surgical diathermy and electric lesion generator. Of these MNSUs, the number 3 MNSU was attached to the British Garrison Hospital, Bareilly, and the number 2 MNSU was attached to the number 3 Indian British Garrison Hospital (IBGH) at Poona. The number 3 MNSU was later moved to Imphal (with 43 Imperial General Headquarters [IGH]), where they received casualties from Burma, Arakan and Thailand. In majority of cases, the journey took 5-6 days, by ferry, ambulance and other vehicles. The results were obviously poor. The advancing Japanese Army forced relocation of the MNSU to Comilla, where it functioned until 1944. This unit handled over 3000 cases. Number 2 MNSU was moved to Dacca in 1944. The aim of neurosurgical units had been to receive cases within 72 hours, which was often not achieved. Patients with cranial injuries were accorded Priority III for evacuation and were often not operated by the surgeons in the field. Both these units departed from India in 1944. After the war, to fulfill the neurosurgery requirements, a neurosurgical center of 100 beds was established at 126 Indo-British General Hospital [IBGH] (BT) Poona. This center had a neurosurgeon, an anaesthetist, theatre sister, a general duty medical officer (GDMO) and a stenographer. Soon after its inception, this center moved to Secunderabad. The center had air-conditioning and was able to undertake basic neurosurgical procedures. This center too closed down after the British left India in 1947. The period from 1947 to 1953 saw a decline of neurosciences in the Armed Forces, as no training was available in India and funds were not earmarked for training abroad. In 1953, Maj. SS Maitra returned from Britain after receiving training in Neurology. He was posted to Military Hospital, Delhi (later Army Hospital). He remained in Delhi till 1976, when he also served as Physician to the President of India. Col. AC Ray, the first neurosurgeon of the Armed Forces Medical Services [Figure 1], received his neurosurgical training in the United Kingdom, and returned to start the neurosurgery department at Military Hospital (MH), Lucknow in 1957. 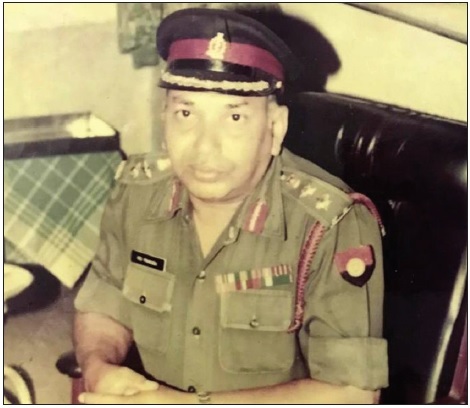 Bereft of even basic facilities, Col. Ray continued to operate with the bare minimum facilities, and was often called to the King George's Medical College, Lucknow to perform neurosurgical operations. A shot in the arm to neurosurgery was provided by the introduction of carotid angiography by direct exposure of the vessel in the neck by two radiologists, Lt. Col. SS Rao and Surg. Lt. Cdr. MP Bhalla. Around the same period at MH Lucknow, Lt. Col. VVS Pratapa Rao a performed a direct percutaneous puncture of the carotid artery with a lumbar puncture needle. Carotid angiography provided the neurosurgeons with the much-needed precision and diagnostic accuracy, and decreased their reliance on painful and cumbersome procedures like pneumoencephalography and ventriculography. Col. (later Lt. Gen.) Rao is also credited with performing the vertebral artery cannulation and angiography by exposing the internal mammary artery in the fourth intercostal space. Further impetus to the growth of the fledgling specialty was provided by the two wars, namely the Indo-Chinese war in 1962, and the Indo-Pak war in 1965. The hostilities brought to the fore the requirement of developing specialist facilities in the Armed Forces Medical Services. 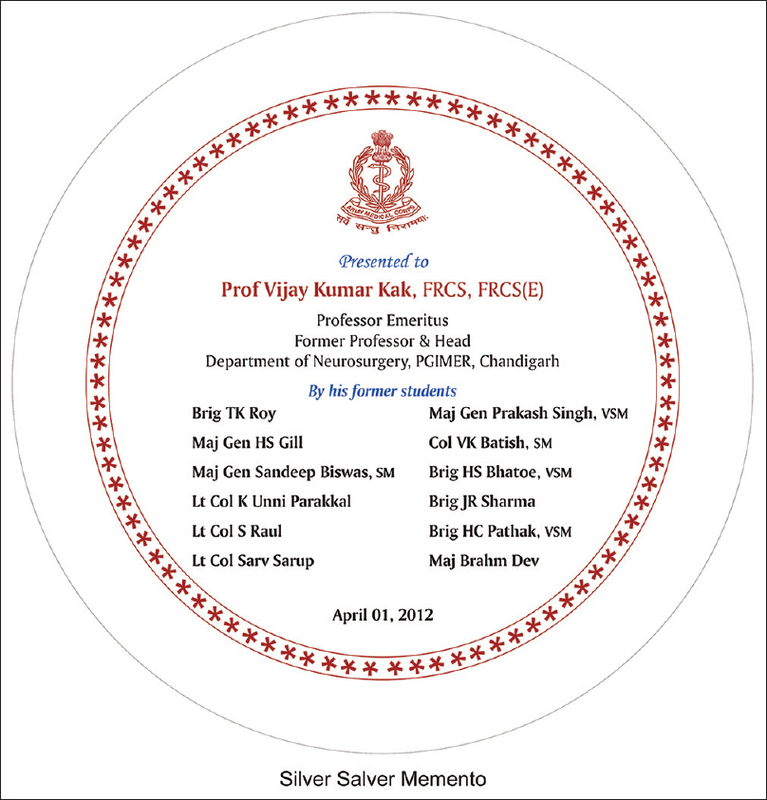 The three neurosurgical centers at Delhi, Lucknow and Poona (now Pune) tackled the war casualties. This period also saw people opting for neurosurgery as a career choice. Prominent among those who joined the specialty included Maj. CP Bajpayee, Maj. Virinder Mohan, Lt. Col. Mahendra Singh, Lt. Col. RS Rana and Maj. SK Bahuliyan. 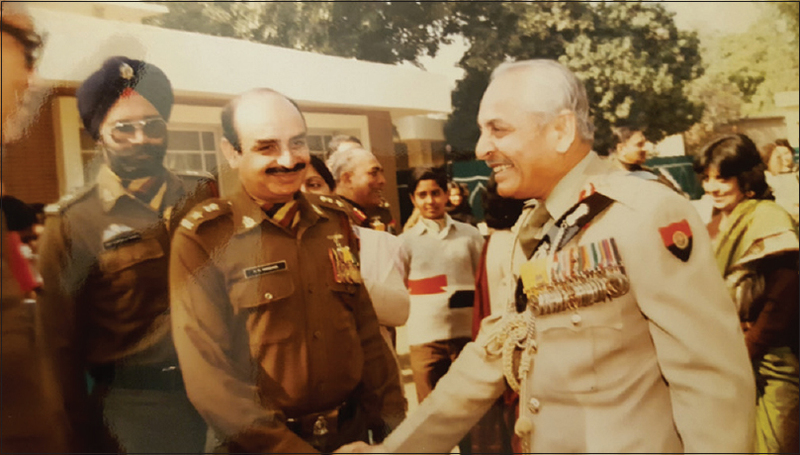 Col. Rana was a American Board certified neurosurgeon, while Col. Bahuliyan was a British national who joined the Indian Army for a short while. The two gave a good start to neurosurgery, establishing various operative procedures and reducing the operating time. 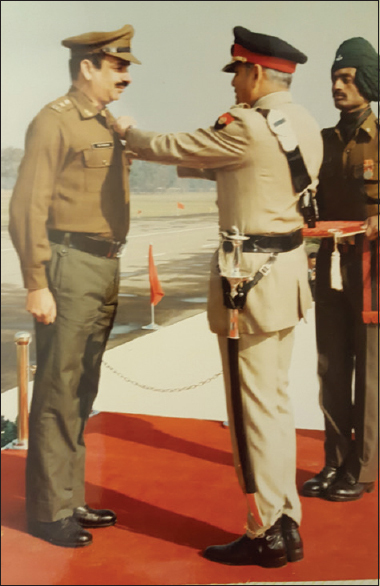 Col. Rana is credited with probably the first direct tackling of an anterior communicating artery aneurysm by passing a ligature around the aneurysm neck. Specialty training was still being imparted abroad. Surg. Cdr. T Surya Rao was trained at Christian Medical College (CMC) Vellore, and served in the Indian Navy Hospital Ship (INHS) Asvini, Mumbai, in the seventies. Maj. (later Lt. Gen.) Suraj Prakash was trained in Australia, where he also received Fellowship of the Royal Australasian College of Surgeons (FRACS). Maj. (later Brig.) CP Bajpayee was trained at Bristol, United Kingdom. An exception was Maj. Vijay Sagar Madan who was commissioned after he had worked in the Department of Neurosurgery, King George's Medical College, Lucknow. Neurosurgery centers were gradually established at selected Command Hospitals (Command Hospitals are tertiary referral centers for the Armed Forces). After Lucknow, these centers were established in Poona (now Pune), Military Hospital Delhi (now, Army Hospital Research and Referral, Delhi Cantonment), as well as Calcutta (now Kolkata), with usually a single surgeon with formal or informal training in neurosurgery. Imaging facilities that form the basis of neurosurgical decision-making were primitive, in the form of myodil myelography, pneumoencephalography, carotid angiography, discography, etc., Electroencephalography became available in all the neurosurgical centers. Without the luxury of power-driven tools, magnification and light, as well as bipolar diathermy, the era was that of wide laminectomies and large craniotomies. The operating time was very long and results were poor. Surgery for hydrocephalus became fruitful once the diversionary shunts became available. The 1971 war was a major catalyst for change – for the better – in neurosciences in the services. Neurosurgeons like Lt. Col. Mahendra Singh [Figure 2], Lt. Col. VS Madan, Lt. Col. Suraj Prakash and Lt. Col. CP Bajpayee managed the bullet and splinter injuries of the brain and spine in Delhi, Calcutta and Pune. This period also saw the advent of bipolar cautery and precision instruments in the operation theatres. 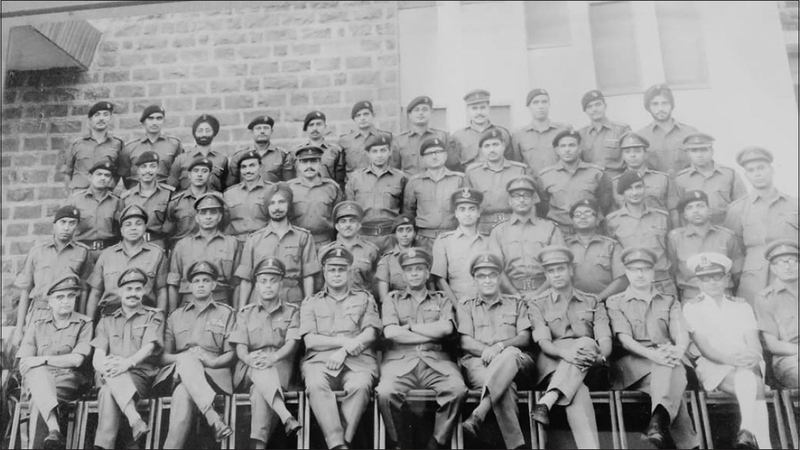 The Armed Forces Medical College hosted its first national level neurological conference in 1977, which was inaugurated by the then Chief of the Army Staff, Gen. TN Raina, MVC (Maha Vir Chakra). Brig. 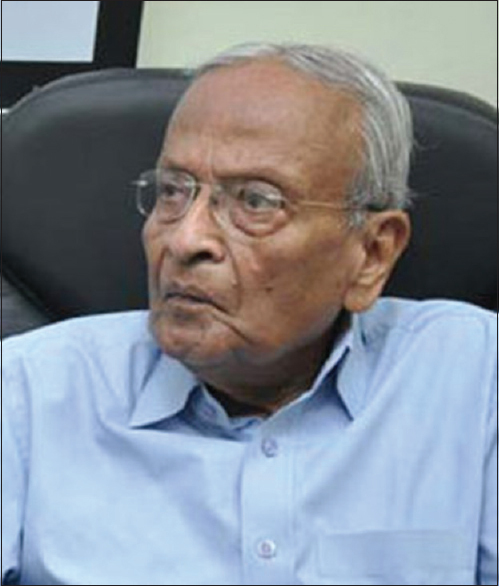 Mahendra Singh was elected the President of Neurological Society of India in 1978. 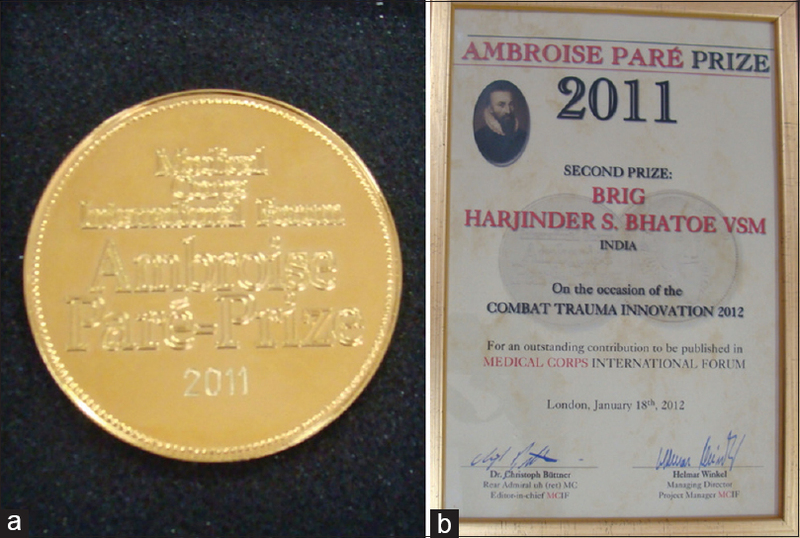 Maj. VS Madan was awarded the E. Merck medal for experimental work on traumatic paraplegia [Figure 3]. 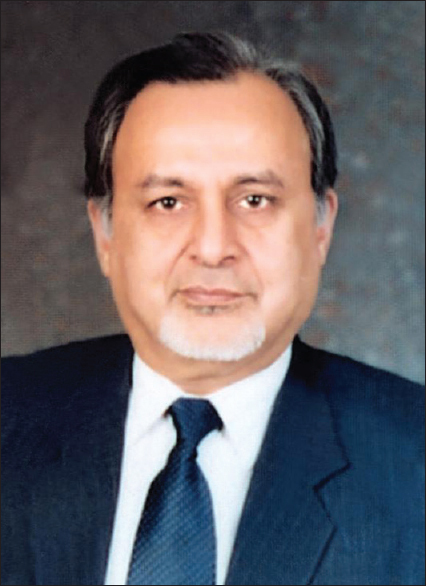 Much of the progress in neurosurgery in the seventies and eighties is attributed to the efforts and vision of Maj. (later Col.) VS Madan, who was seconded to Neurosurgery in 1968 due to his overwhelming efforts towards and his aptitude in Neurosurgery. In 1969, while at Command Hospital Lucknow, he was enrolled for MS (Neurosurgery) at King George's Medical College under Prof. VS Dave and Dr. Goodwin Newton. He was soon baptized by fire, when in 1971, he established the Neurosurgery Center at Command Hospital, Calcutta and managed war casualties from Bangladesh almost single-handedly. He flew to Dacca a day after the surrender of Pakistan Army and operated on Pakistani prisoners of war over the next ten days. Neurosurgical foundations were built literally brick-by-brick. 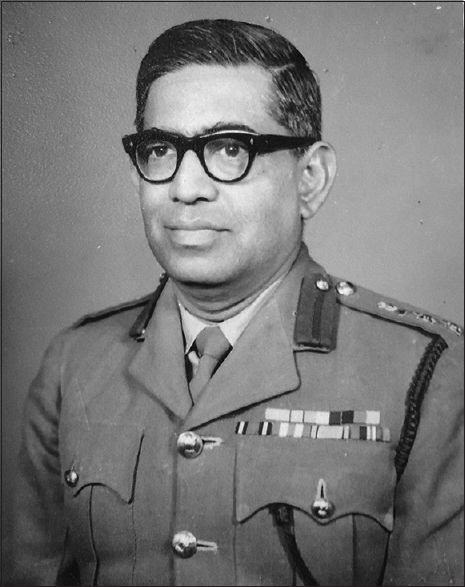 Col. Madan also introduced magnification and superior optics by the use of loupes, and pioneered the surgery of lumbar discs by minimally invasive technique of fenestration, altogether avoiding laminectomies. During 1975-1977, he was sent to the United Kingdom, and was trained under Prof. John Gillingham and Mr. Phillip Harris. Col. Madan is also credited with performing the first cervical spinal fusion by Cloward's technique. 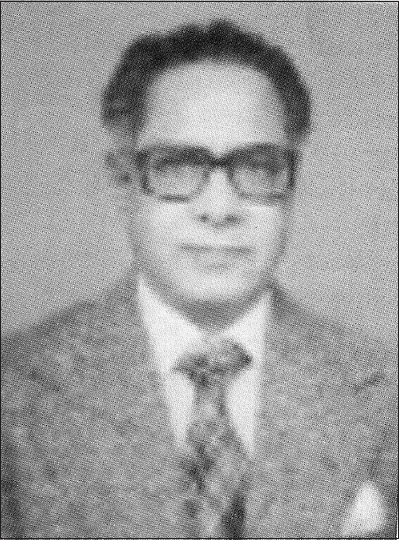 He received the Vishisht Sewa Medal in 1987 [Figure 4] and [Figure 5]. A skull table with pressure injectors was installed in Delhi and Pune in the early nineties, and power-driven craniotomy equipment was made available. A 16-channel (GRASS) encephalography (EEG) machine, as well as equipment for assessing electromyograms (EMG) and evoked potentials were made available. With the training of specialists in India, the neurosciences began to find their feet and began delivering good results. The eighties and nineties were a period of consolidation, evolution and self-actualization, and the neuroscientists began to make their presence felt in various fora and meetings at the national level. A number of scientific papers from the Armed Forces were published in various national and international journals. Training of new specialists continued, and Department of Neurosurgery, Command Hospital (SC) Pune was recognized for imparting MCh (Neurosurgery) training in 1992 [Figure 13]a and [Figure 13]b. Lt. Col. Ashwini Kumar Sharma (now Major General) was the first candidate to do MCh from Armed Forces Medical College, Pune. 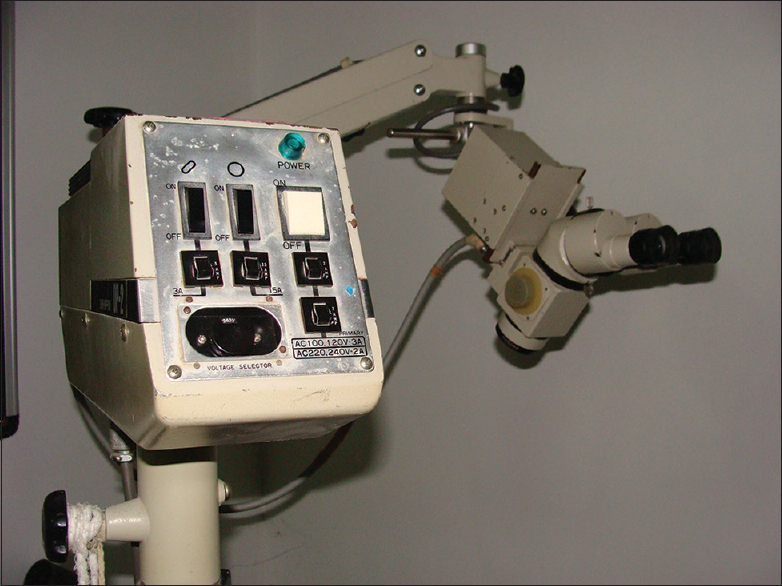 Neurosurgery got its first operating microscope [Figure 14], and Radiology its first computed tomography facility in Command Hospital, Pune in 1992. The nineties and the first decade of the new millennium saw the contributions of Lt. Col. Prakash Singh, Lt. Col. PK Sahoo, Lt. Col. AK Dubey, Lt. Col. VK Batish, Lt. Col. HS Bhatoe, Lt. Col. BS Walia, and Lt. Col. HC Pathak. Neurosurgical procedures became more refined, precise and introduction of spinal instrumentation gave fillip to spine surgery, which till then was stagnating at the laminectomy stage. 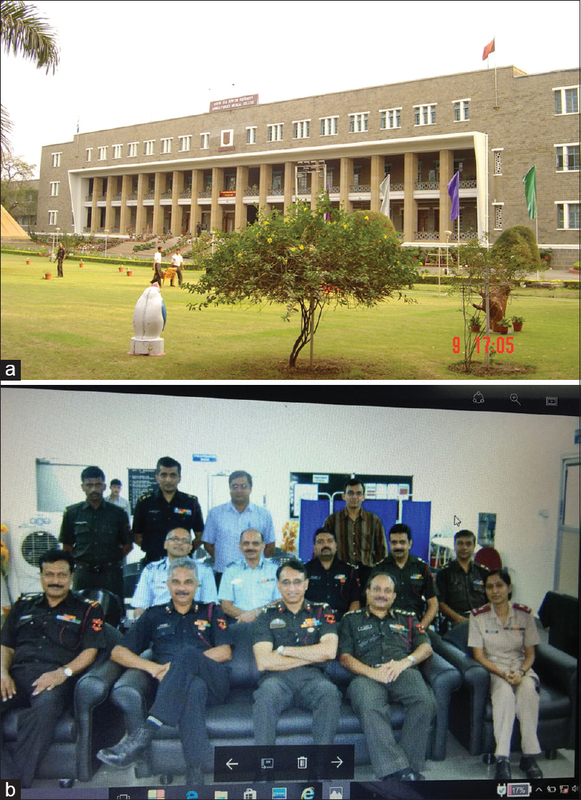 The advancement was meteoric with the commissioning of the Army Hospital (Research and Referral) at New Delhi. New benchmarks for the standards of neurosurgical procedures and care were established, with the first cervical disc replacement in the country being done at Army Hospital (Research and Referral) in 2002 by Col. PK Sahoo. Provision of neuronavigation, stereotactic apparatus and operating microscope gave much needed contemporary ambience to the department at Army Hospital (Research and Referral), duly supported by imaging techniques like magnetic resonance imaging, multi-slice computed tomography, positron emission tomography, interventional and vascular radiology [Figure 15]. 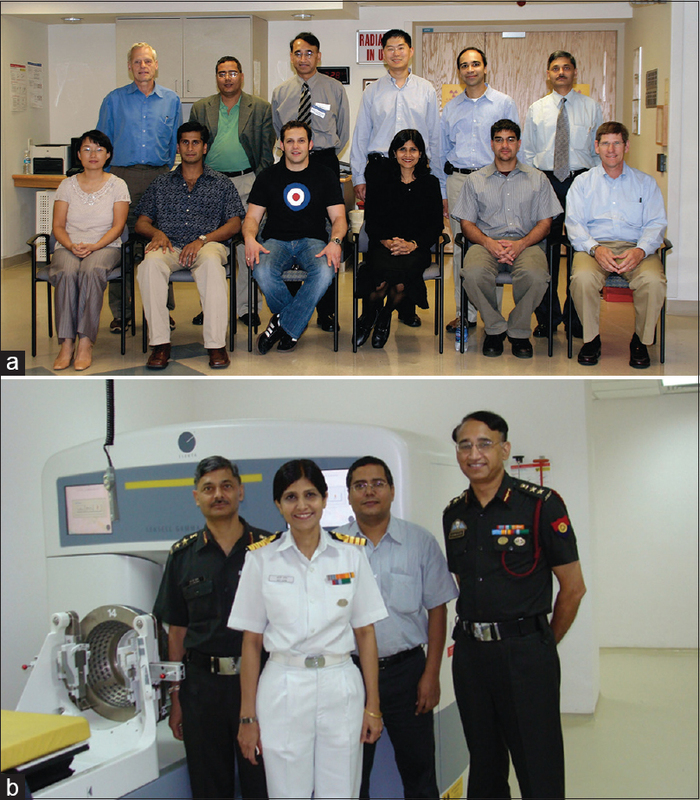 The crowning event was establishment of Gamma Knife Surgery Centre at Army Hospital (Research and Referral) in November 2007, for which four specialists were flown to University of Pittsburgh, USA for training in July 2007 [Figure 16]a and [Figure 16]b. Nearly two hundred patients had been treated with Gamma Knife Surgery till the end of 2017. Col. Prakash Singh did pioneering work on deep brain stimulation for refractory movement disorders with excellent results. Newer centers were established in Command Hospital (Northern Command) Udhampur, Jammu and Kashmir, Command Hospital (Western Command), Chandimandir, and a neurosurgeon was posted at Srinagar, principally to tackle militancy-related neurotrauma. Neurosurgery Centre was established in INHS Asvini Mumbai in the year 1994 when Surgeon Commander Charu C. Verma. took charge. He served for more than eight years and was succeeded by Sug. Cdr. KI Mathai. Neurosurgery in the Indian Air Force was slower in evolution. The Neurosurgery center was established in Command Hospital Air Force (CHAF) Bengaluru, by Lt. Col. P K Sahoo in June 1998. He started from scratch and established a state-of-the-art Neurosurgery Center at CHAF Bengaluru. He was followed by Lt. Col. H C Pathak in 2002. The Air Force had to wait till August 2002 to get its first Neurosurgeon – Wg. Cdr. M S Sridhar (the first Armed Forces alumnus from NIMHANS Bengaluru). The Neurosurgery center was commissioned at the Base Hospital, Delhi Cantonment for neurosurgical services to the Delhi Garrison, especially for tackling neurotrauma. 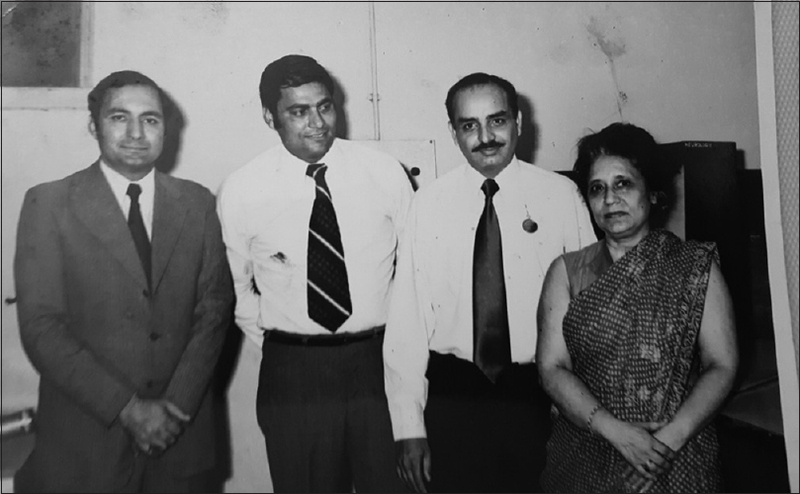 Lt. Col. P K Sahoo was the first neurosurgeon to start the center in 1997, However, Lt. Col. A K Sharma was the neurosurgeon who was instrumental in equipping the center and establishing it. It is manned by Col. Tony J. Rappai (an M Ch alumnus from AFMC Pune) and Lt. Col. Anil Kumar, who received his training at the AIIMS New Delhi. Brig. HS Bhatoe, Lt. Col. BS Walia and Lt. Col. TS Vasan have the distinction of being paratroopers. Brig. 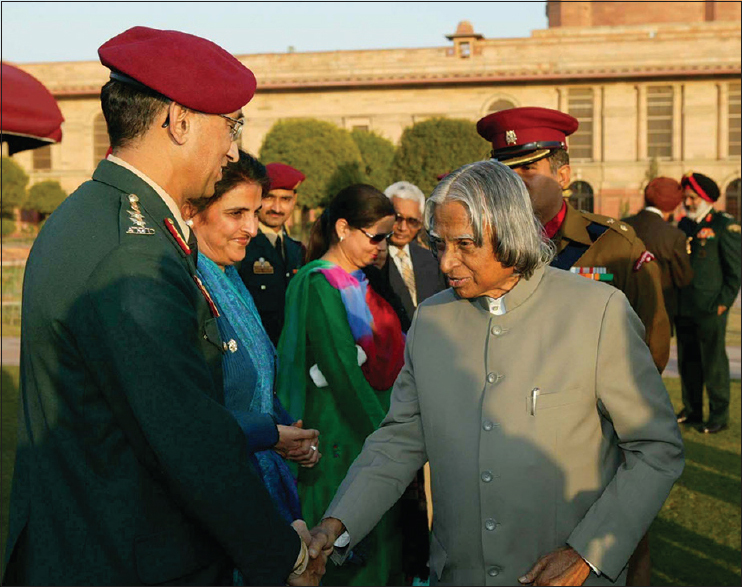 HS Bhatoe also has the distinction of having served as Regimental Medical Officer to the President's Bodyguards, at Rashtrapati Bhavan [Figure 17]. Brig. Maneet Gill has the distinction of heading the Department of Neurosurgery at Army Hospital (Research and Referral) Delhi Cantonment, which was established by his father, Maj. Gen. HS Gill [Figure 18] and [Figure 19]. Neuroscientists of the Armed Forces have been academicians as well. Nearly 75 projects, funded and approved by the Armed Forces Medical Research Committee, have been completed by neurosurgeons and neurologists. A number of scientific papers on stroke in the young, neurocysticercosis, high altitude related neurological problems, sequelae of boxing injuries, use of botulinum toxin for movement disorders, and many others, have appeared in national and international journals of repute. Stem cell therapy is being evaluated in patients with stroke, spinal cord injuries, amyotrophic lateral sclerosis, and other disorders. For neurosurgeons, management of brain tumours, trauma, and intervertebral disc disease constitutes the bulk of workload. The wartime experience of 1965, 1971 and 1999 operations provided the experience of missile injuries. These studies and analyses have been presented in various fora, and published in journals. Prominent among these have been the presidential address of Brig. 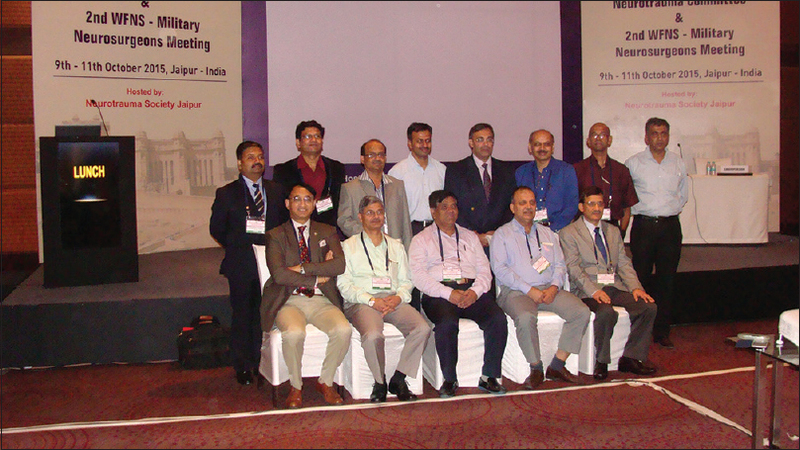 Mahendra Singh [Figure 2] at the Neurological Society of India meeting in 1978, and by Col. Prakash Singh during the Armed Forces Medical Research Committee (AFMRC) meeting in 2003. 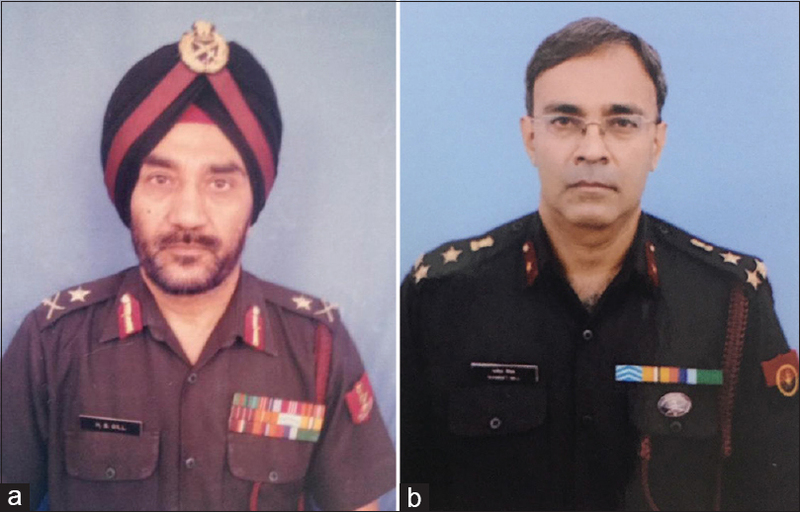 Papers have been published by Lt. Col. CP Bajpayee, Lt. Col. HS Bhatoe [Figure 20]a and [Figure 20]b, and Col. Prakash Singh. The Kargil experience of 1999 firmly established the role of conservative debridement and repair of dura in the management of gunshot injuries of the brain. The rich experience led to the publication of a monograph on the subject by Brig. 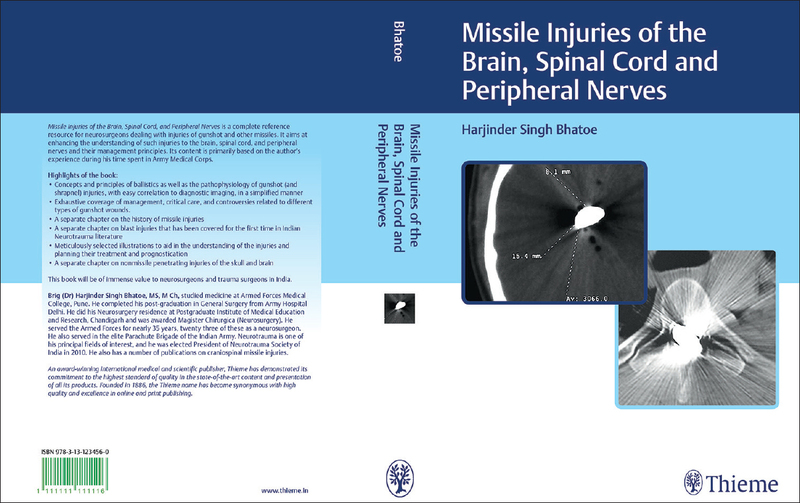 HS Bhatoe (its second edition was released in October 2018) [Figure 19], who also has the distinction of being the Founder-Editor of a national journal, The Indian Journal of Neurotrauma. 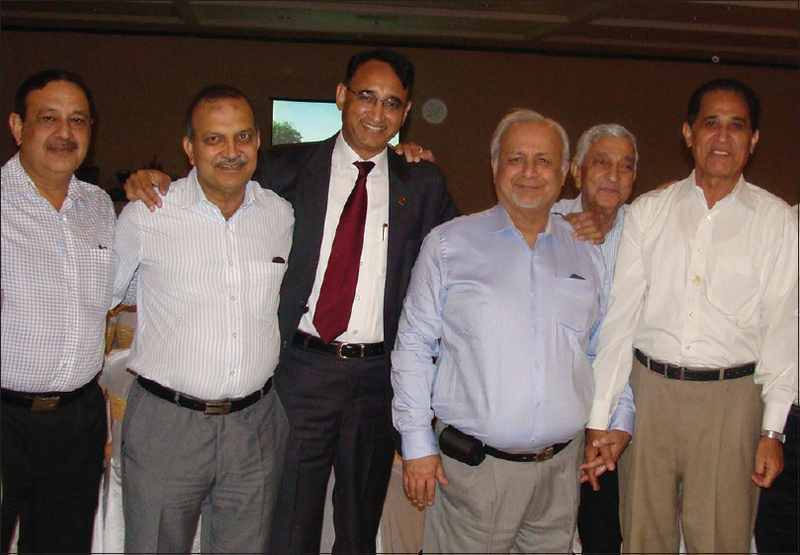 Col. Madan presented a much-appreciated paper on the management of intracerebral hematoma, during the World Congress of Neurosurgery in New Delhi in 1989, while Brig Bhatoe has presented papers at the World Federation of Neurosurgical Societies Congress in Boston and Seoul, and in the Congress of Neurological Surgeons Annual Meeting in New Orleans. Besides neuro-trauma, a number of papers have been published on neuro-oncology, spinal tuberculosis, skull base surgery and intracranial aneurysms. The Armed Forces neurosurgeons have been operating upon intracranial aneurysms and anterior skull base tumors by a small, eyebrow “keyhole” approach with much better results. The military neurosurgeon's practice is similar to his civilian counterpart in many ways. While spine surgery is about 50% of the overall workload, majority of these surgeries are for degenerative disc lesions, followed by trauma and tumors. The incidence of brain tumors is the same as in the general population, and together with the cerebrovascular lesions, form a major component of the neurosurgical workload. Pediatric neurosurgical problems are seen almost to the extent seen in civilian population due to the children of armed forces personnel being entitled treatment in service setups. However, during deployment, neuro-trauma (both combat-related and non-combat related) is the major concern followed by oncological and vascular pathologies. 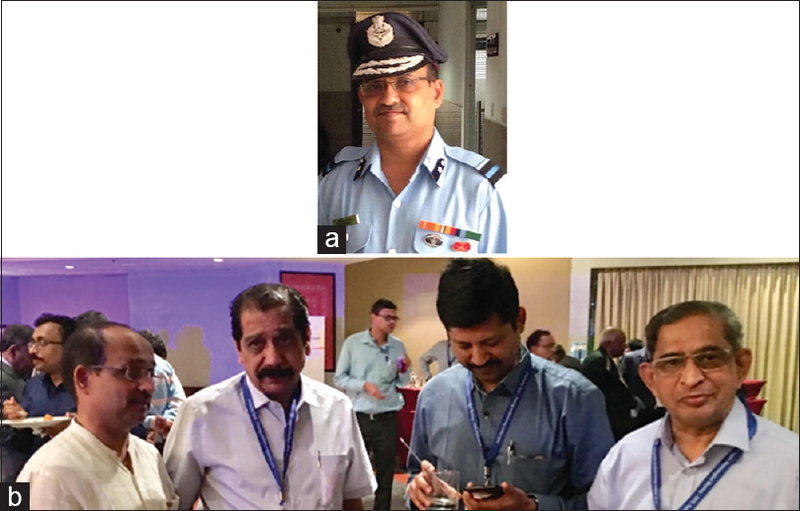 Spinal problems specific to aviators have been studied in detail by Air Commodore MS Sridhar. Neurosurgeons are deployed in the Command Hospitals (Pune, Lucknow, Chandimandir, Kolkata, Udhampur, Air Force Hospital Bangalore and Naval Hospital Asvini, Mumbai). In times of hostilities, depending on the ground situation and terrain and local infrastructure, neurosurgeons can be deployed in the forward locations also. Surg. Capt. T Surya Rao has served onboard Indain Navy Ship (INS) Vikrant, the aircraft carrier. It is a privilege and honor to work with the men and women of the Armed Forces. Patriotism takes a real shape, and life-long bonds are forged in times of shared hardships. Neurosurgeons in the Armed Forces [Figure 21] are in a unique position to offer specialized treatment and hope to men and women of the Armed Forces, their families and children. The relationship with the troops and neurosurgeons has evolved since the austere times of Col. AC Ray to the present day. In the present day scenario, Neurosurgery Centers of the Armed Forces are heavily committed to contemporary patient care, research and teaching, as well as mentoring. It is heartening to see the service neurosurgeons finding their place on the national scene, and making positive contributions in their own way. The authors gratefully acknowledge the kind help and inputs provided by Maj. Gen. S Biswas (retired), Maj. Gen. HS Gill (retired), Col. VS Madan (retired), and Prof. AK Banerji in the formulation of this article. Bhatoe HS. The great neurosurgeon and spinal surgery. Col (Dr) Vijay Sagar Madan. J Spinal Surg 2015;2:106-7. Gupta SK, Mukherjee KK, Chhabra R, Tripathi M. History of Neurosurgery at Postgraduate Institute of Medical Education and Research, Chandigarh. Neurol India 2017;65:134-51. Singh M, Sawarkar D, Sharma BS. 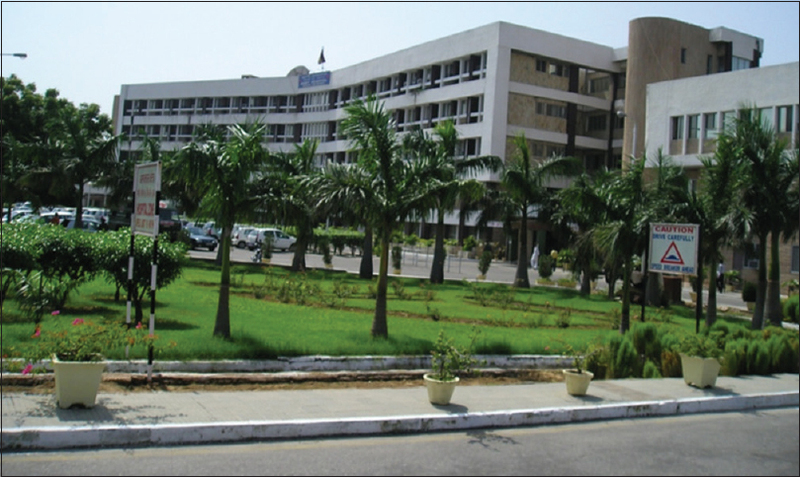 Neurosurgery at All India Institute of Medical Sciences, a center of excellence: A success story. Neurol India 2015;63:589-96. Army Hospital Research and Referral. Available from: http://www.eduhelpindia.com/college.php?id=1415. [Last accessed on 2018 Oct 25]. Sahoo PK, Bhatoe HS. Cervical disc replacement for spondylotic myeloradiculopathypathy. Med J Armed forces India 2006;62:112-5. Bhatoe HS. Transciliary supraorbital keyhole approach in the management of aneurysms of anterior circulation: Operative nuances. Neurol India 2009;57:599-606.